Thursday is the most popular day for posting jobs, according to an analysis by Jobfeed, the labour market analyses tool of Textkernel, on 2,2 million Dutch jobs* posted between 1 July and 15 December 2013. Jobfeed shows that more than 19% of all jobs in the Netherlands is posted on Thursday. In addition to Thursday, also Friday and Tuesday are popular days to post vacancies in the Netherlands. 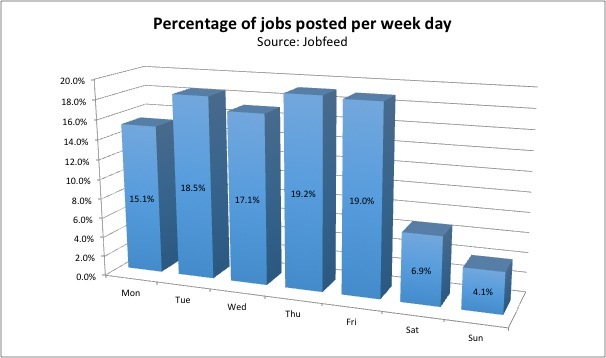 This can be seen in the graph below that shows the number of job postings per day. The extent to which jobs are posted on these days is a minimal difference. Hoever, this does not apply for the weekend. In the Netherlands few jobs are posted in the weekend. On Sunday, only 4% of all jobs are posted. Also Monday stays behind with 15%. Whether this is wise, may be doubted. According to research by Connexys (in Dutch) for radio station BNR, most applications take place on Monday. When looked at the behaviour of direct employers and intermediaries, some differences appear. 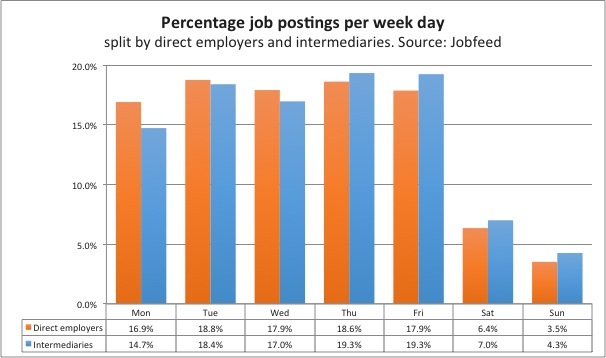 Intermediaries post their jobs almost as often on Friday as on Thursday, while direct employers have a preference for Tuesday (and Thursday). This can be seen in the graph below that shows the percentage of job postings per week, for direct employers and intermediaries. You can also see that employers post their jobs less often than intermediaries in the weekend, but more often on Monday. Jobfeed also collects and analyses the jobs in Germany and France and is able to make cross-country analyses. These analyses show that in Germany and France, most jobs are posted on Wednesday (17,9% and 18,6%). In both countries Thursday follows as a popular day to post jobs. 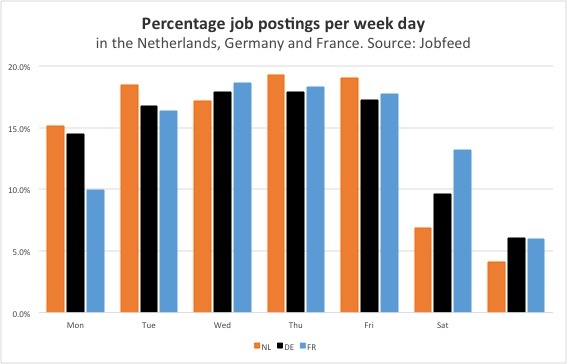 When you compare the countries, you can see that the Netherlands is very active in posting jobs on week days, but less active than France and Germany in posting jobs in the weekend. Numbers come from Jobfeed, the labour market analysis tool of Textkernel, that collects and categorises all online jobs and makes them searchable. For this analysis, 2.2 million jobs posted between 1 July and 15 December 2013 have been analysed based on their spider date. This is the date that the Jobfeed crawlers found the job (this can differ with the visible date in Jobfeed: the processing date). To be sure that the spider date is indeed the posting date, only the job postings (including duplicates) have been taken into account that have been posted on sites that Jobfeed spiders with a minimum of once a day. This comes down to 96% of the total number of posted jobs in that period.